The highly consolidated competitive landscape of the global clostridium vaccine market for animal health is likely to remain in a similar shape over the coming years, according to a research report released by market intelligence firm Transparency Market Research. Eli Lilly and Company, Boehringer Ingelheim, Zoetis, Inc., and Sanofi-Aventis, Merck & Co., had collectively held a share of more than 63% in the global clostridium vaccine market in 2015, owing to a high rate of investment in research and development as well as possessing strong distribution channels. According to the research report, the leading players in the global clostridium vaccine market are likely to portray expansion strategies in the form of innovative marketing, mergers and acquisitions, and targeted in-licensing. A growing volume of marketing and sales in the market is being shifted to online media, thanks to the booming ecommerce industry and the scope of the healthcare industry with it. The global clostridium vaccine market is expected to reach US$643.5 mn by the end of 2024, after expanding at a healthy CAGR 4.9% within a forecast period from 2016 to 2024. The market was valued at US$418.0 mn at the end of 2015 and is slated to expand swiftly in North America and Asia Pacific. North America already held a dominant share in 2015 in the global clostridium vaccine market, due to the provision of advanced healthcare infrastructure and a large and growing number of pet owners and an animal husbandry industry. “Government initiatives can play a vital role in most aspects of the healthcare industry, and the global clostridium vaccine market is no exception. The market for veterinary healthcare in China, for instance, is primarily driven by the government’s involvement and impetus. Thanks to their active role in the animal care industry, the market for clostridium vaccine in China has received a major boost in the form of finance and development scope,” states a TMR analyst. A lot of countries are similarly pushing for better animal care due to the growing demand for animal products and the need to prevent the spread of diseases within and through the animal population. Nearly 40% of the global GDP in agriculture relies on the production of animal products such as eggs, meat, and milk. The market for animal products in emerging economies is especially worth watching due to the growing demand for them from all consumer demographics. 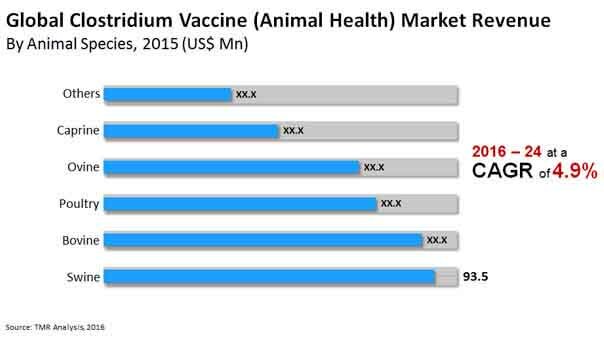 The market for clostridium vaccine is simultaneously expanding in these regions due to a growing level of awareness regarding the upkeep of animal health. “Despite issues such as these, the global clostridium vaccine market is expected to witness a heavy influx of demand from Asia Pacific and the MEA due to a growing rate of awareness regarding overall animal health,” adds the analyst. This is a key concern for emerging economies, as the high level of government involvement could actually reduce the overall profitability for private players. The government of India, for instance, plays a central role in the purchase and distribution of several animal vaccines. The resultant sale of vaccines in bulk at reduced prices could create a void for globally prominent players in the vaccine industry, thereby reducing the overall supply in the region.